Looking for a better way to sync GoldMine contacts, calendars, and tasks to Outlook, Gmail, Google Apps, IBM Notes and Domino, and GroupWise? Need to track emails against GoldMine contacts and accounts? Would you like to have offline and online access to GoldMine CRM data on iPad, iPhone, Android, BlackBerry, and Windows Phone mobile devices? Riva can help. With Riva On-Premise, there is a 5-user minimum purchase. dedicated workstation that has to be logged in to GoldMine at all times. Riva is the leader in CRM and email integration. Since 2008, we have developed server-side integrations for a dozen of the world’s best CRM systems – including GoldMine 2015, GoldMine 2014, GoldMine 2013, GoldMine 9.x, and GoldMine 8.5 – and five enterprise email platforms. 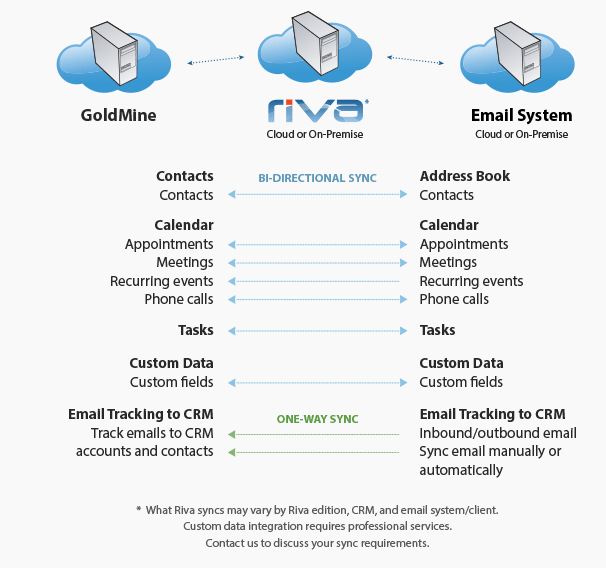 Riva syncs GoldMine directly to Exchange, Office 365, Gmail, Google Apps, IBM Notes and Domino, IBM SmartCloud Notes, IBM Verse, and Novell GroupWise. There are no client-side Outlook, Gmail or IBM Notes plug-ins to install, configure, manage, or fix. This is just one of the reasons why Riva is trusted by over 1,000 companies, including 35 Fortune 500 customers, 12 of the largest banks in the world, numerous Global 1000 accounts, and hundreds of small and medium-sized businesses.